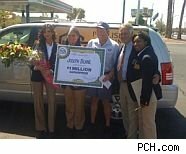 Publishers Clearing House agreed to pay $3.5 million, not to a lucky prize winner, but to a collection of states that accused the marketing company of once again misleading consumers. A decade after the company, best known for its million-dollar sweepstakes, got itself in hot water for misleading consumers into buying things to improve their chances of winning, it was accused of the same thing. Seniors had been the most vulnerable back then -- and this time, too. In announcing the settlement today, Illinois Attorney General Lisa Madigan said the agreement strengthens settlements first reached in 2000 and 2001. The latest judgment, filed in Cook County Circuit Court, stemmed from an investigation into the Publishers Clearing House's marketing practices. In total, the company will have to pay $3.5 million total to the states and revamp its marketing campaigns. Publishers Clearing House said it admitted no wrongdoing by agreeing to the settlement. "While the vast majority of Americans know that a sweepstakes offers a free chance to win a prize, this agreement protects the remaining few who may have difficulty understanding by providing additional consumer education, disclosures and outreach," the company said on its web site. "We've heard from consumers who've spent hundreds of dollars purchasing products from Publishers Clearing House because they believe - wrongly - that it will increase their chances of winning," Madigan said in a statement sent to Consumer Ally. "The tougher provisions in this new agreement will help ensure that Illinois residents are not further misled or confused by the company's sweepstakes promotions." Many of the Illinois complaints were from seniors or their children. One senior reported spending $2,126 on merchandise over the course of one year in hopes of claiming a prize. "After spending so much, I can't believe I never won a dime," the senior told Madigan's office. Another Illinois consumer said her 84-year-old father is devastated each time he learns he is not the winner and falsely believes he's in a better position to win because he makes purchases and gets personalized mailings from the company. Publishers Clearing House also agreed to identify and survey consumers over age 65 who spend $500 or more during a quarter and drop those consumers from its mailing list if they misunderstand the sweepstakes. The company also must send non-promotional letters to consumers who spend more than $1,000 in a year telling them purchases don't improve the odds of winning. Oregon Attorney General John Kroger said the agreement requires Publishers Clearing House to increase its efforts to inform consumers that making a purchase does not increase their chances of winning. The company also must hire an ombudsman to review mailings to insure compliance with the settlement. In addition to Illinois and Oregon, states participating in today's settlement included Alaska, Arizona, Colorado, Delaware, Florida, Georgia, Hawaii, Idaho, Maryland, Michigan, Minnesota, Mississippi, Missouri, Nebraska, Nevada, New Mexico, North Carolina, North Dakota, Oklahoma, Pennsylvania, Rhode Island, South Carolina, South Dakota, Tennessee, Texas, Vermont, Virginia, Washington, West Virginia and Wisconsin and the District of Columbia.